A soft blue light descends upon delicate Chinese artifacts housed inside dark cabinets. Each has a dedicated source of light announcing it. From a distance, the mechanism holding them vanishes, leaves them floating like fragile notes on an invisible music sheet. The room is quiet, ceremonial. The song of hammers and drills can’t touch this sacred space. Nobody dares speak. Not our tour guide. Not even to say how this subtle mastery has been achieved. If the devil lives in the details, something is about to become the most devilish cultural destination in South Florida. The new favorite one, too. 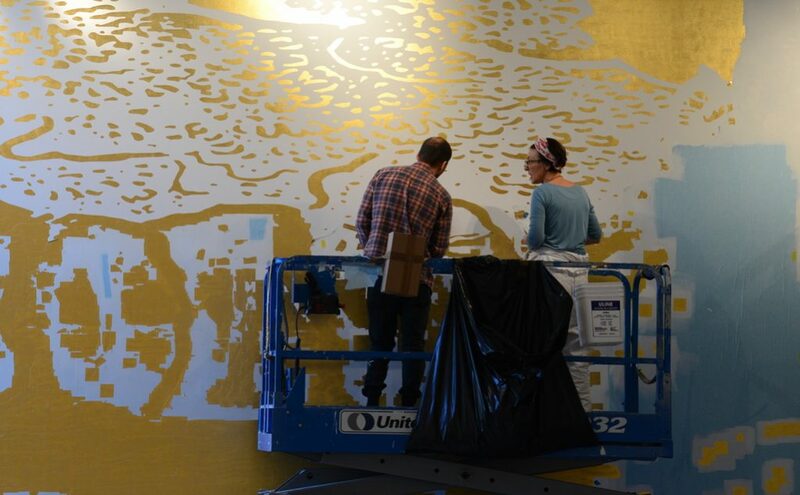 I’m referring to the new Norton Museum of Art, which is making its highly anticipated debut Saturday, having undergone a $100 million makeover and grown its exhibition space by 35 percent. 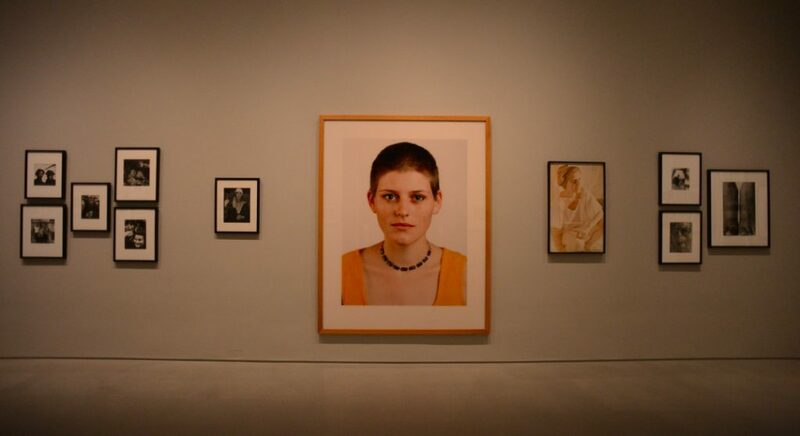 The extra room affords the Norton’s photography collection its own dedicated gallery for the first time. The most noticeable change is the dramatic main entrance now facing South Dixie Highway, which is framed by a monumental, ancient banyan tree to the left and a curious 19-foot pop-art sculpture to the right. 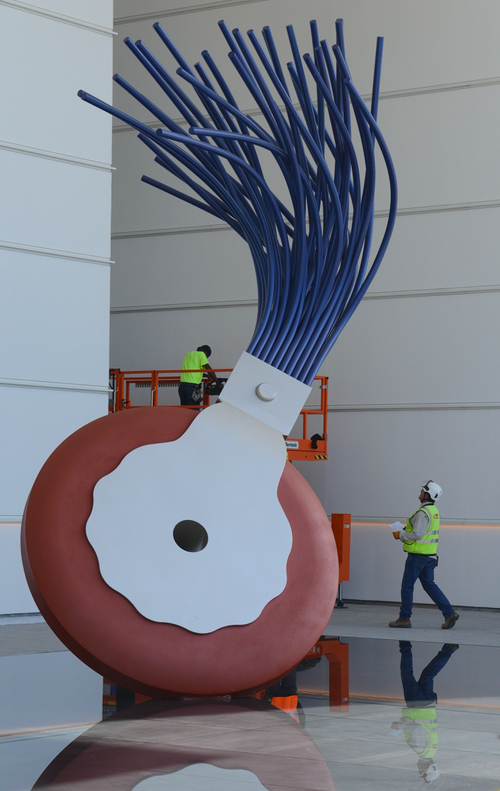 Typewriter Eraser, Scale X, by Claes Oldenburg and his wife, Coosje van Bruggen, balances deliberately off-center on a reflecting pool that complements the calming white façade. “It’s unmistakably a museum. It’s unmistakably about art,” said John Backman, project director of the 59,000-square-foot expansion and the boldest endeavor the 78-year-old institution has undergone. The minimalist custom-made mounts are among many subtle features contributing to the transformation. The Baltimore-based specialist hired for the task spent three months on site to fabricate them. 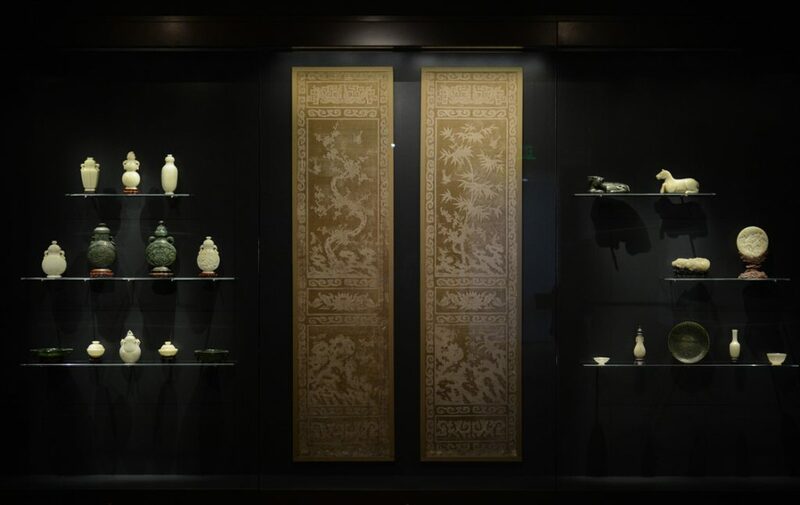 From the newly restored parquet floors and LED lights to the newly designed galleries housing the Chinese collection, the new structure is seriously committed to the mission of celebrating and advancing culture. It manages to do that without coming across as uptight and pretentious; a message perfectly conveyed by that fun Oldenburg sculpture consummating the shaded entrance plaza. Other works simultaneously debuting include an elaborate mandala piece by Damien Hirst featuring a butterfly motif, a set of 16th-century paintings capturing a Chinese Lantern Festival in Nanjing and a playful installation by artist Rob Wynne extending along a new three-story stairway. Inspired by the museum’s beachy location, the work consists of 6,000 hand-poured mirrored glass bubbles and letters evoking the sea and marine life. Designed by renowned architect Lord Norman Foster, the Norton’s new building is a drastic departure from the original 1941 design and marks a huge point of differentiation from other cultural venues in Palm Beach County. It stands ultra-modern but avoids the institutional, clinical feel that plagues many modern structures by connecting the interior with the exterior at every turn, such as in the brand-new restaurant. Softening the structure’s sleek armor and metal roof canopy are views of the sky and subtropical plants, which are visible through elegant glass panels. The use of glass predominates throughout the venue and delivers a particularly striking effect in the Great Hall, from where the robust branches of the old banyan tree can be seen. Opposite from the 28-foot-tall window hangs Eikón, a large-scale tapestry piece commissioned from American artist Pae White and woven in Belgium. This generous space, located to the left of the admission counter, has a living-room vibe and treats visitors to comfortable lounge seating, refectory tables and a coffee bar. Fabric wall panels and special acoustic plaster were used for sound-absorbing purposes. What gives this room that airy, relaxing, light quality? Look up. The 44-foot high ceiling culminates in a gigantic oculus skylight. The visitor experience, which Alswang calls “a museum’s greatest pleasure,” was the force driving many tiny decisions from door handles and handrails to light fixtures and furniture placement. The clarity in the floorplan, which grants visitors a clear east-west line of sight, was also deliberate. 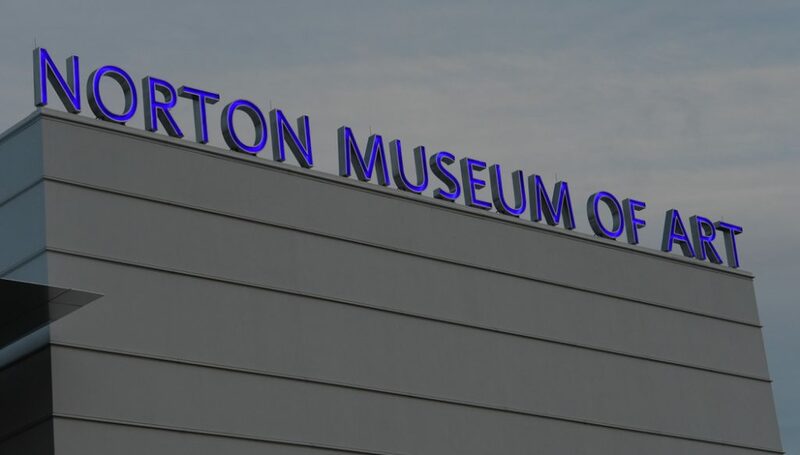 Museum officials also recently announced there would be free admission every Friday and Saturday, and Art After Dark events will now run through 10 p.m.
Long before the daring expansion broke ground three years ago, the community could sense it would be something special. For one, the visionary design was by British architecture studio Foster + Partners, whose previous projects include the Museum of Fine Arts in Boston, the Hearst Tower in New York and that translucent Apple store in Kyoto, Japan. There was no doubt when the vivid renderings of the plan went public. It was audacious, massive and stunning; so much so that gifts from inspired museum trustees and community friends began pouring in. Last year alone, the Norton received a 100-artwork donation from Howard and Judie Ganek and the largest single philanthropic gift in its history: $16 million from Florida native Kenneth C. Griffin. The new building is named after him. Seeing it through completion and leaving it all behind is bittersweet to say the least, admits Alswang, whose retirement comes a few weeks after the grand opening. Under her leadership, the museum added 1,600 new objects to its portfolio. She would like to see it grow more under the new executive leadership of Elliot Bostwick Davis, who starts March 2. That goal should come easier now. The London-based firm also took on the task of designing the garden spaces when the project team struggled to find an architect that understood the inside-outside compatibility. Contemporary sculptures by George Rickey, Keith Haring, and Mark di Suervo, among others, now adorn the “great lawn” that serves as an outdoor gallery. It replaced the museum’s former paved entrance. With only a few weeks until the big reveal, Backman reflected on his own journey. “You are managing crisis after crisis. You get fatigued. But then you get these moments that wake you up,” he said while recalling one particular glorious night on the job. The parapet letters with dimmable lighting had just crowned the unrecognizable building with a recognizable name. From across the street, Backman looked back at the illuminated building. •	New exhibitions include: Modern Spontaneity: Ralph Norton’s Watercolor Collection and Nina Chanel Abney, as part of the RAW (Recognition of Art by Women) series.